Think of a classic photographic image of the Oregon coast and chances are it came from the camera of award-winning Newport photographer Chuck Forinash. For well over 30 years his work has appeared in galleries and art collections, on postcards and brochures, in hotels and restaurants, even on billboards. A native of Newport, Chuck set off to college to eventually become a dentist, or perhaps a doctor like his father. An elective course in photo journalism changed his life’s path. Capturing compelling images seemed to come naturally to him. He entered and won a photography contest sponsored by Pacific Northwest Bell and his photo of the Yaquina Head Lighthouse appeared on more than two million phonebook covers. When a college counselor told him he could make a career of photography, Chuck never looked back. Initially he worked as a newspaper photographer and shot scenic coastal images in his spare time. Soon his photographs began appearing in galleries, which in retrospect was a difficult way to make a living. His photos sold well, but after printing costs, framing, and gallery fees, there wasn’t much money left over. As many artists eventually learn, Chuck realized that talent wasn’t enough; he’d also have to become proficient at the business side of the industry. He started by designing a series of postcards. After seeing the “proofs”, eight local businesses committed to sell them. Taking those commitments to his local banker, Chuck was able to get a $5,000 loan to cover the printing costs. The postcards sold quickly. He added additional images to the collection. More than 30 years later, those eight original local businesses, and many more, still sell his postcards. 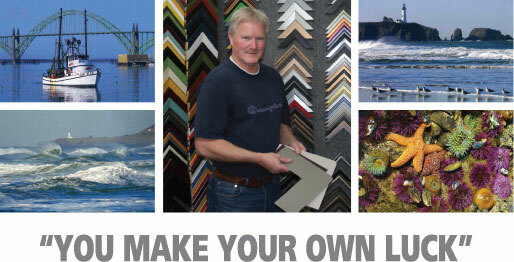 Millions of Forinash postcards have been mailed worldwide, each promoting the Oregon coast in the process. As demand for his photography grew, Chuck decided to open a working studio and framing shop in South Beach. It turned out to be a sound business decision. By framing his own works he was able to control costs. In addition, framing for others produced steady, year-round, income. Chuck was careful to only hire framers with an artistic eye. The framing shop earned a reputation for quality, and today serves a large loyal clientele which includes renowned local artists Michael Gibbons and Rick Bartow. In 1988 the owners of the Portland area Newport Bay Restaurant chain commissioned Chuck to shoot a series of photos. Those images became the focus of the restaurants’ décor and are still seen by thousands of diners each month. When the chain expanded to the Seattle area, Chuck was again commissioned to shoot the restaurants’ large format photographs. Décor photography became an important segment of his company’s income. His work was purchased for display in motels, homes, businesses, even public buildings. Chuck’s photography also began to appear in commercial publications such as brochures. 1999 marked the opening of the Forinash Gallery on Newport’s historic bayfront. The popular gallery displays the works of more than a dozen artisans, as well as an extensive collection of Chuck’s photography. It’s a casual mix of fine arts and crafts. Wine tasting, gourmet coffee and classical music enhance the atmosphere. The gallery will pack and ship artwork to anywhere in the world, a convenience appreciated by locals and visitors. From a business standpoint, Chuck’s success is a classic example of the maxim “you make your own luck”. But that old adage also applies to his photography. “To shoot a great scenic image you have to know the right places, understand the light, and be patient enough to capture the perfect moment in time,” explains Chuck. “Paying careful attention to composition allows you to create an image of depth in a two-dimensional media.” In other words, it’s not luck. Forinash Framing Studio and the Forinash Gallery employ six and support the work of many local artists and photographers. Chuck has purchased the buildings as well as several other local properties. 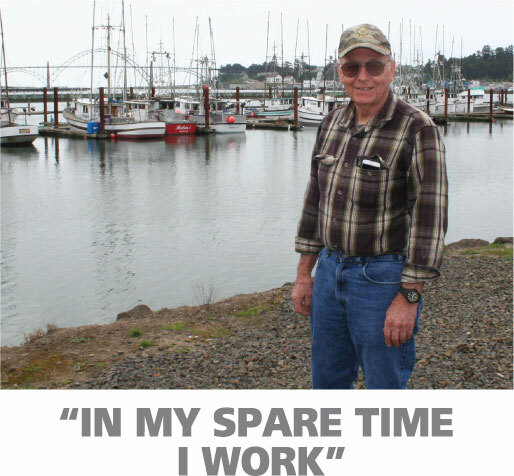 In fact it was a real estate loan that brought him to Oregon Coast Bank. After ten years the note on one of his buildings became due, and his old bank made the renewal process difficult. 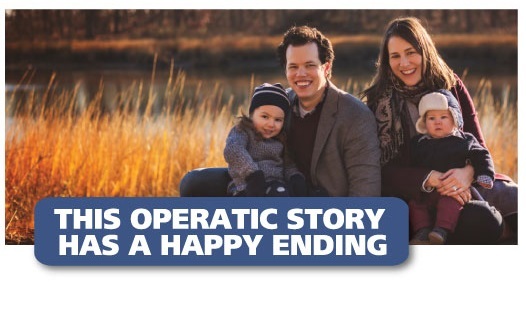 He called Oregon Coast Bank and was told “whatever you need, we’ll make it happen.” Within days, Oregon Coast Bank made the loan. “That got my loyalty pretty fast” Chuck remembers. These days Chuck has become an avid user of Oregon Coast Bank online banking, checking his balances and moving money between accounts. But he still appreciates the business feedback he gets from his bankers and often visits our Newport office, sometimes just to say hello. Chuck remains an in-demand photographer, but he recognizes that it’s his mix of businesses that has allowed him to continue pursuing his passion through economic and technological changes. “The variety keeps it interesting”, he says. With an attitude like that, his success is no surprise.